For an introduction into a new field of research an anthropologist depends upon people who ‘guide’ the researcher to new contacts. People in such strategic positions are called ‘gatekeepers’, since they play a crucial role in processes of including and excluding (groups) of informants. Moreover, gatekeepers become partners in conversations that may lead to shifts in defining the object of research: the interlocutors often advise on research directions. As Marilyn Strathern (2005) puts it aptly: the object of research is always formulated ‘in company’. She urges researchers to pay attention to the context in which research is set up. We should study the social process of setting up and carrying out research, from the very first e-mails onwards. Analysis starts at the beginning before the beginning, so to speak. This is vital advice, particularly in my research on gold mining where the ‘company’ is a gatekeeper in a most literal sense: an actor that has the power of authorizing access to specific spaces. In earlier research the spaces were mining concessions, in French Guiana it was a National Park. In both cases we encounter gatekeepers who control or try to control spaces, by prohibiting or limiting access. 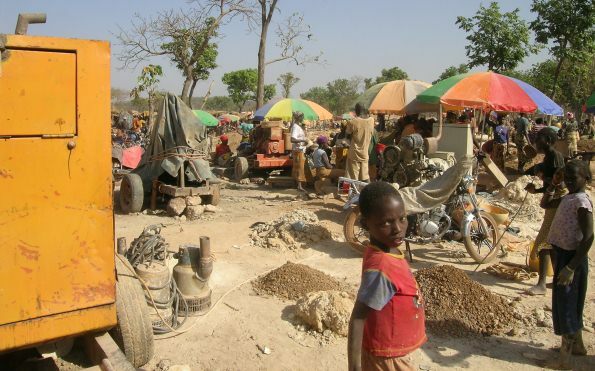 Moreover, in both cases ‘illegal’ artisanal miners are the main group the gatekeepers are trying to confine. Conversations I had a few weeks ago at the Headquarter of the Parc Amazonien in Cayenne, capital of the French Département Guiana, reminded me of previous first conversations in the process of negotiating access to an area marked by artisanal mining: the mining concession of AngloGold Ashanti in Guinea, West Africa. My conversation in Cayenne was the last in a line of appointments in a short, first period of fieldwork in French Guiana. Interestingly, I talked to a lot of people about small-scale mining, but I failed to visit actual mining sites. Illegal mining is seen as a major social and environmental problem in the south of French Guiana. Harsh actions by gendarmes and military, together with the initiative to set up the Parc Amazonien, are part of a longer history of the French state’s attempts to control the region and the small scale mining that is taking place. In this context, organizing a visit to a mining site proved difficult. So, when I met the Director of the Parc in Cayenne, my goal was twofold: I wanted to interview him on the complex socio-political dynamics the initiative of the Park is involved in. Secondly, I wanted to ask advice on how to proceed in order to visit small scale mining sites in future fieldwork. For the Director of the Park the appointment served a different purpose. Given our focus on the cross-border dynamics of gold mining in Suriname and French Guiana, he proposed a research collaboration; the efficacy of control over the Park area depends heavily on what happens in both Suriname and Brazil (most of the miners are Brazilian). Our project was seen as a potential contribution to problem solving. This conversation in company had a different meaning for both of us, and felt like a déjà vu. It rang a bell. Research that involves transnational gold mining companies (TNC’s) requires beginnings before the beginning. In areas where mining companies have concessions you cannot just walk in. Access to the area has to be negotiated, not with local populations who may live on the concession, but with the mining company. In 2008 I had to negotiate access to a big mine for the first time. At the time I was doing research in Burkina Faso, where the construction of a gold mine was under way, but no producing gold mine had yet been established. Since I wanted to know what a big mining operation entailed - both socially and spatially - I decided to try and visit the big gold mine of AngloGold Ashanti in Siguiri, Guinea. Through friends I was able to contact the chief geologists of the operation. The mail exchange is still one of the most beautiful examples of defining research topics ‘in company’. I had made clear that my goal was to see how a big mine produces gold, but the company was just as clear about its own agenda. A visit from an anthropologist could provide ‘useful inputs for the company’s artisanal mining strategies’. Indeed, this mining operation is situated in the heart of the ancient Boure goldfields, once a major resource for the Mali Empire. In 2008, at least 30,000 small scale miners were working within the boundaries of Anglo’s concession. For Anglo, artisanal mining is a fact of mining life in this region and they were grappling with how to organize ‘co-habitation’. Anthropologists could perhaps help out. Indeed, during our visit Anglo was keen to show us the artisanal mining taking place on the concession. Our request to be shown the industrial production, on the other hand, was almost completely ignored. I remember feeling awkward while visiting artisanal sites in the presence of senior staff of the mining company. Very much like June Nash (2007), I was aware of the stilted conversations with miners in the company of the premises’ gatekeepers. The differences in power became painfully clear. Understandably, powerful gatekeepers make appointments and grant access to premises when they think this is useful to them. The anthropologist is first of all seen as a potential ally who may help solve the problems identified by the gatekeepers. This may affect how the anthropologists redefine a research focus, but also their role as knowledge broker. The anthropologist is defined in terms of a potential consultant. In Occupying Spaces Created by Conflict (2011), Catherine Coumans deals with the tricky distinction between anthropology and consultancy for mining. Anthropologists claim to be experts in ‘getting close’ to grass root groups. When getting close depends upon gatekeepers who see these groups as a problem, the knowledge production itself may become precarious. Coumans puts it quite bluntly when she sketches a thin line between anthropology and espionage. Indeed, the way in which anthropologists obtain access and broker knowledge deserves our full attention, for methodological as well as ethical reasons.